These are some common model railroad terms used in model railroading that you may not easily find elsewhere and are often written in model railroading articles and books without explanation. Access area: An opening in the middle of a layout that will allow a person to to access an area that would otherwise be unreachable from the edge of the layout. Articulated: A type of steam locomotive where the engine moves separately from the frame. This way, a large engine could be used on railroads with tight or standard curves. Ballast: the rocks used between the rails and ties to keep the tracks aligned and allow for adequate drainage. Consist: the list and/or order in which multiple engines or train cars are lined up. Consolidation: a type of steam engine produced by Baldwin with a specific wheel arrangement designated as 2-8-0 indicating that it had a single leading axle with 2 wheels followed by four driving axles with a total of 8 wheels, and no wheels in the rear of the engine. Extruded Foam: Available in building supply stores sold as sheets and often used for subroadbed on top of plywood as a base for your model railroad. Can also be cut into various shapes and built up to create land formations. Flextrack: a flexible 3ft length of track that can be used on a layout either as a straight track or curved to whatever radius desired. Can be cut to various lengths using rail cutters. Freightyard: Several sections of track on a layout often connected by a ladder of turnouts, used for switching freight cars and forming trains before being dispatched to another area of the layout. The cars are usually lined up in such a way that they can be easily dropped off at various locations along the scheduled route. Gauge (often confused with "Scale" - see below) is the term used to describe the distance between the 2 rails of track - usually 4 ft 8-1/2in ("standard gauge") in the prototype. "Narrow gauge" is a term used for rails that are closer together than standard gauge - usually around 3 to 3 1/2 ft.
"Givens and Druthers" - A phrase originated by the late John Allen relating to how a model railroader should balance the list of things that can't be changed (like room size, budget, etc.) with the wants and desires of what s/he would like to be included in the railroad during the layout planning process. 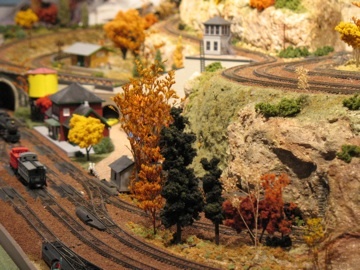 Handlaid track: a model railroad term referring to track that a modeler has laid himself using raw materials. Helix: a circular corkscrew section of track used to get trains from a lower level to a higher level of a layout - often hidden from view, with trains entering through a tunnel on the lower level and exiting from another tunnel or from behind some trees or a mountain on the upper level. Homasote: a pressed paperboard often used as subroadbed. Available in building supply stores. Interchange - a place where trains from 2 or more routes and/or companies meet and exchange freight cars or passengers. Junction - a place where 2 or more railway routes either merge together or diverge to separate routes. This allows trains to transfer from one route to another. Train traffic is controlled by turnouts (switches) and signals. Kitbashing: A model railroad term referring to the use of one or more prefabricated kits to build a new unique model. Often used for constructing buildings that are unavailable commercially. Or just another fun way of being creative. Layout Design Elements (LDE's) - Small parts of a larger railroad that are visually and operationally similar to the prototype used in track planning for model railroads. L-girder: a method of creating strong supporting benchwork inexpensively. Reverse Loop - A track configuration that curves around, turns back and reconnects to itself for the purpose of turning a train around and returning to the same track from which it came. Roadbed: the built up "earth" upon which track is laid. In the modeler's world, we usually use cork or foam roadbed which is commercially available in hobby stores for this purpose. Scale refers to the ratio between the measurement of a model compared to that of the prototype. For example, HO scale = 1:87 or 1/87 the size of the prototype. Scratchbuilding: a model railroad term meaning to create a model from scratch (from raw materials), not using prefabricated kits. Selective Compression - Creating or planning a small model scene, based on a much larger prototypical area, with the scale dimension of distance being significantly shortened for space considerations, while maintaining enough visual and operational similarities to make it recognizable and functional. Staging yard: several lengths of track on a layout used for storing or putting trains together before an operating session. Often hidden but they don't have to be. Subroadbed: the base supporting platform on which your layout will be built. usually plywood and another material on top such as homosote or extruded foam sheets. Train - one or more locomotives with or without railcars operating on rails or track for the purpose of transportation of products or services. Various types of trains are defined on the Operations Page. Turnout: A section of track used to switch a train from one track to another. Also called a switch in real life, but as a model railroad term, this is often confused with wiring switches. Operation: Running trains on a layout ideally in a realistic manner. An operating session usually implies one or more operators running trains in a purposeful way from one point to another on a layout delivering goods or services according to a certain time frame determined by a "fastclock" simulating scheduled arrivals and departures, etc. Procedures can be varied according to the chief dispatcher's directions. All for fun, of course and providing a purpose for a bunch of friends and families getting together for an evening. Prototype: the real thing. 1 to 1 scale (1:1). What we get excited about when we see it coming down the tracks in our home town. Wye: a special type of turnout that forms a "Y" or "fork in the road" so that a train may be directed to the right or left. Also refers to a type of track arrangement forming a triangle that will allow a train to turn around. From "Model Railroad Terms" to "Homepage"